Traders, commercial motorcyclists and sympathisers gathered at the hospital. Five died instantly while another 5 died on their way to the hospital. The tragic situation has left a market with sudden calmness it has never seen. A journey that began from Ilesa Baruba in Kwara State has ended in agony, throwing an entire market into mourning. At least 10 persons that trade in Oluode Market in Osogbo have died in an accident. The truck laden with yam tubers could not get to its destination, but perished in Ifon-Osun, Osun State. Tuesday at Oluode Market in Osogbo was more like a normal residential area because of the unusual calmness around the very noisy market, leaving one with a feeling of sadness and alarm that something was wrong. Traders, shop owners and even commercial motorcyclists popularly called Okada riders wore long faces over the tragic occurrence as shops were shut, and activities were in the low. The accident according to reports claimed about 10 lives with many reportedly injured. According to impeccable sources, the traders were coming from Ilesa Baruba along Saki in the Oyo/Kwara States boundary where they had gone to buy their goods. 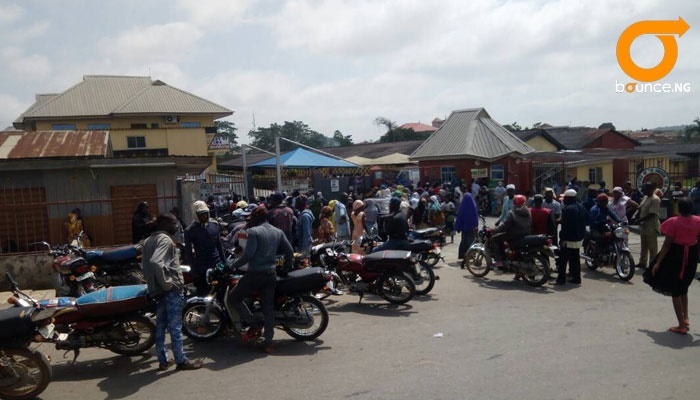 Fellow traders at the market, okada riders and other sympathisers had gathered at Our Lady of Fatima Catholic Hospital in Jaleyemi, Osogbo where the injured are. Bounce News reliably gathered that the truck reportedly developed a fault which resulted in the accident. The driver of the truck and about 5 passengers were said to have died instantly while about 5 others gave up the ghost while on their way to Our Lady of Fatima Catholic Hospital. Bounce News was at the hospital, but was denied access, as the gate of the hospital had been locked due to the high turnout of sympathisers who have continued to throng the health facility. Risikat Abike, a trader at the Oluode Market, could not hold back her tears. She could not believe she lost 2 of her colleagues who sold goods near her shop. For Ajibike Nofisat, a yam flour trader at the Oluode Market, the whole story about the accident was still like a dream, as she was torn between tears and joy. She was one of the persons meant to travel with the ill-fated bus but for her youngest child who suddenly developed fever overnight, she could not join them the morning they travelled. A medical staff at the hospital, who pleaded anonymity, confirmed the accident saying the hospital is working tirelessly to save the lives of those still on the danger list.